Buster Keaton was one of the first visionary auteurs of American cinema, but sadly, most of his 1960s film appearances were essentially shticky cameos in fare like How to Stuff a Wild Bikini. However, his collaboration with future Nobel Laureate Samuel Beckett would make cinema history once again. Frankly, Keaton did not think much of the self-consciously experimental short film, but it earned him a five-minute standing ovation at the 1965 Venice Film Festival. Ross Lipman chronicles the chaotic production and studies the resulting Film element by element in the provocative docu-essay, Notfilm (trailer here), which opens this Friday at Anthology Film Archives. It is pretty bold of Lipman to make a one-hundred twenty-eight-minute film about a twenty-four-minute short, especially when he immediately professes skepticism regarding art about art. Yet, icons such as Keaton and Beckett provide a bounty of grist for the analytic mill. 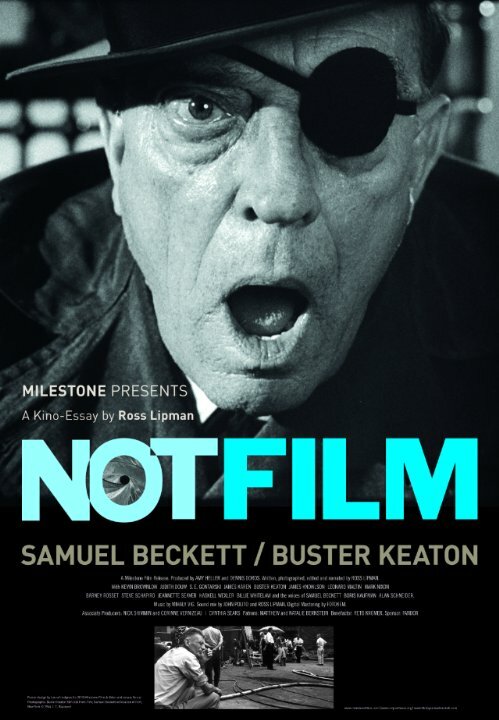 In fact, Notfilm is immediately notable as the film in which “Beckett Speaks,” thanks to audio tapes furtively recorded by Barney Rosset, his American publisher and the producer of the simply titled Film. Clearly, as the only screenplay penned by Beckett, the authorship of Film is undeniably his, even though the Irish playwright’s preferred stage director, Alan Schneider took the helm. It seems his American colleague approached the cinematic piece much as he did Beckett’s plays, marshaling cast and crew to faithfully carry out Beckett’s intentions. 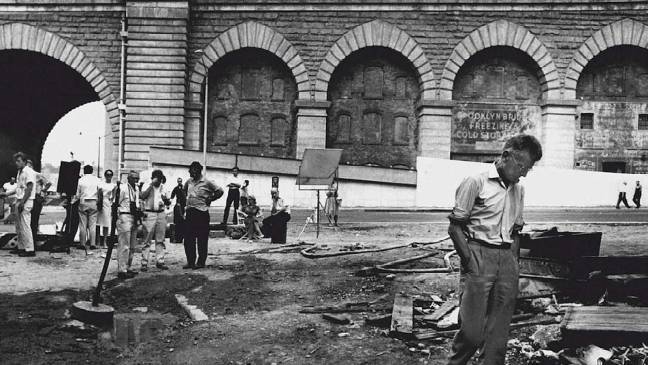 Yet, Beckett himself would flip the script when a disastrous first day’s shooting nearly scuttled the entire project. Despite the relative shortness of both the film and its production schedule, the story of Film is rather epic. By all accounts, the two geniuses did not mesh well together. Both are long gone, but surviving co-star James Karen (a cult favorite for his work in Return of the Living Dead and Poltergeist) talks at length about the chaotic shoot and his friend Keaton. He definitely sways viewers over to Team Buster. Lipman supplies a close reading of the film, Film, in which “E,” short for Eye, chases “O,” short for Object, through Fulton Street into an almost entirely empty single-room-occupancy. O will tear up images of God and his past before coming face to face with E, his doppelganger. Indeed, you do not need a masters in comparative lit to recognize Beckett’s familiar themes and motifs. Regardless, the details and connections Lipman provides are often fascinating. There are also a fair number of weird coincidences and chance encounters (like Leonard Maltin visiting the set as an eager junior cineaste) that might not mean much, but give the film greater texture and dimension. Arguably, the more Lipman stretches, the more interesting it gets. It is refreshing to have Karen’s less than awestruck commentary so prominent in Notfilm. Nevertheless, most viewers will leave with a greater appreciation of both Keaton and Beckett. Lipman has a relatively small cast of talking heads, but they are all significant, especially the late Billie Whitelaw, who also gets her due as the preeminent stage interpreter of Beckett’s work. Watching Notfilm before Film might actually be preferable, giving viewers greater context to appreciate the work that inspired it, which makes it quite a rare case indeed. In all honesty, filmmaker-restorationist-author Kevin Brownlow is right on-target with his lukewarm assessment of Film. Once you have seen it, you recognize all the Beckettisms for what they are. There is nothing that will appreciably deepen with repeat viewings. Ironically, there is considerably more to engage with in Notfilm. It is the most successful work of docu-criticism since Richard Misek’s Rohmer in Paris. Highly recommended, Notfilm opens this Friday (4/1) in New York, at Anthology Film Archives, alongside nightly free screenings of Film throughout the week.